If you are looking to make it big in the eCommerce industry, then Amazon is somewhere you would and should start. You not only get the platform to showcase and market your product to a wide range of audience, but also get the product shipped to customers, all for a small fee. Basically, you can witness orders from the very first day the product is listed. So, Why Should You Sell Anywhere Else? This is a question that will be plaguing most Amazon seller – Why should I go anywhere else? It’s guaranteed you will get sales and revenue growth by just being an Amazon seller, piggy backing on Amazon’s customer base. But, it boils down to the fact that whether you want to be branded as an ‘Amazon Seller’ forever or want to build a successful brand that customers recognize and love? If you keep selling under Amazon’s brand, it’s only their brand recognition and popularity that keeps increasing and there is nothing in it for you. For Amazon, you are just another seller who is bound to the seller policy of ‘Do’s and Don’ts list’. Any mishaps or mistakes, you could be out of business – just like that. So, Don’t be shocked! 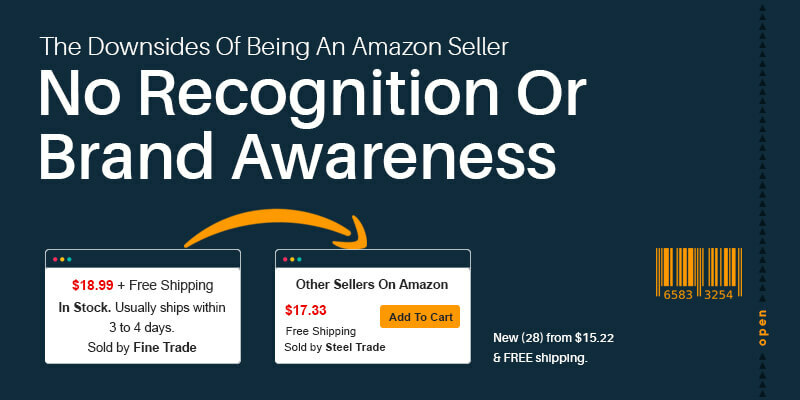 Amazon has the power to withdraw your selling privileges and it has happened to many already. You can end up being stuck with thousands of dollars worth of stock, unsure about how to move on with your life. We will go into the specifics about that later, but for now, let us focus on the importance of building your own brand and in turn turning your business into a booming success. How An Amazon Customer Shops? But, you – being an Amazon seller’, is not in the list of factors, at least to 98% of customers who shop using Amazon. Amazon Will Never Favor Sellers.. Being an Amazon seller, you must know about Amazon’s customer-centric policies. Their recommendation and search result algorithm are completely based on giving the value based suggestions to customers. Meaning, they don’t care if your product sells or not. So, coming back to the knitting needles, I will probably choose the one that’s giving me the best value. Once I open the page and choose to buy the knitting needle, I decide to buy yarn along with it and, obviously Amazon makes wonderful recommendations and too bad, its not one of your product. This makes the customer move out of your brand and to the other products. There is nothing that helps you build any sort of customer relationship when you sell on Amazon. You basically have no clue about customers who buy your products. You get a list of customers and the address to ship the product. There is no way you can build a dedicated email list to gain a repeat customer base. eMarketer report states that 81% of eCommerce customers who receives email based on their previous shopping habit are more likely to respond to targeted messages. In the end, they are Amazon’s customers and only Amazon can enjoy the privilege of gaining repeat customers, whereas you need to battle for your product visibility against new sellers who crop up every single day. If you look at Amazon’s net revenue in 2016, it was $136 million and in that $111 million was directly through the Buy Box. Wow, right? This only shows that 80% of the business goes to the sellers who get listed in the Buy Box. If you are an Amazon Seller, then you are no stranger to the buy box because you are either already there or trying to be there. The screen shot below gives an ideal outlook about the importance of buy box and why sellers are so keen to be on it. As you can see, the Amazon algorithm to place you on the buy box is to offer the most competitive price. So, most sellers have to cut into their profits to get the visibility. Technically, in the race to be on the buy box, the sellers keep bringing down the price to get the competitive edge. If you are doing business for a long time, you should know that is a bad strategy to base your business on. Cutting off your profit margin is not a long term success metric, soon you will realize you are losing a ton of money. Amazon marketplace has become a competitive place and if you have a successful formula to build a thriving business there, you should be aware of ‘wannabe sellers’ looking to piggyback on your success. With Aliexpress and other Chinese wholesale marketplace delivering products all over the world, there are many sellers who source products for a much cheaper price and stealing your good customers. Especially, when Amazon is following the buy box strategy, the seller who gives the best price wins. Being a successful Amazon seller takes a lot of hard work. You learn a lot about how to market your own product amongst hundreds of competitors. This experience paves way to market your own brand in a big way. With that said, selling for Amazon is like working in an organization, you are not your own boss and forever bound by their rules. Also, when you are trying to survive in the business world, It’s wise to not put all your eggs in one basket – This pushes the need to branch out and launch your very own eCommerce store. Its A Move You Need To Make Eventually..
We know it’s not a walk in the park. It’s true that building your very own brand is a tough job and could take anywhere between 3 months to 6 months to establish yourself in the market. But, with Amazon not providing sustainable solutions to sellers, it’s a move you need to make to safeguard your business. We will do a post on Amazon seller horror stories, where one fine day Amazon decides to block their seller accounts. It’s a battle uphill only till you acquire the desired traffic, revenue flow and a customer email database. Once you have attained certain organic ranking and a robust marketing and personalization strategy that works for your eCommerce business, you are bound to grow exponentially. If you have any questions about transitioning from an Amazon seller to your very own eCommerce business owners, We are ready to talk. Drop us a message and we can build your eCommerce dream store today, together.